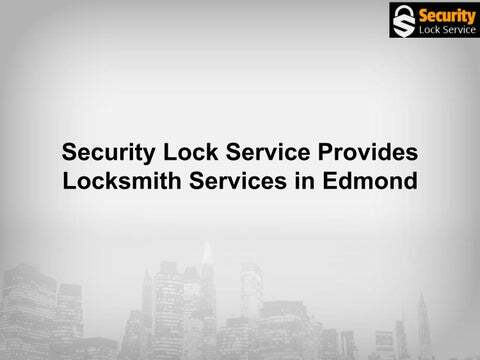 Oklahoma City, OK â&#x20AC;&#x201C; April 14, 2019 â&#x20AC;&#x201C; Security Lock Service is a reliable full-service locksmith solution provider in Oklahoma. They specialize in commercial, automotive and residential services. Established in 1960, Security Lock Service has maintained excellent standards of service through a customer-centric approach. The fully bonded and insured firm provides services with efficiency and agility while complying with the laws governing the industry. They focus on transparency and honesty in their operations while utilizing state-of-the-art technology to meet the security needs of the clients. Their services include lock replacement, lock installation, key duplication, rekeying and much more. They strive to keep residences, vehicles, and premises safe and secure through technical expertise and experience. Speaking about emergency locksmith services, the Company Spokesperson said, â&#x20AC;&#x153;We provide reliable emergency locksmith services that are tailored to the client. Backed by skilled dispatchers and technicians, we ensure that all requirements for emergencies are scheduled immediately. We are available 24/7 including holidays and weekends. Our onsite technicians will always respond promptly with all the needed equipment to solve the emergency. They are well trained, background tested and always ready for your call any time. We handle residential lockouts, commercial lockouts, automotive lockouts, lost keys, break-ins, and broken keys. Security Lock Service is a trusted locally-owned locksmith in Edmond OK that provides comprehensive locksmith solutions to clients. Their steadfast commitment to quality standards of service ensures peace of mind to all customers. The company ensures that lost keys, lockouts, re-keying, access control, and ignition repairs. Their licensed technicians are carefully scrutinized to ensure effective and high-grade solutions at all times. Security Lock Service cares about the security of its clients and will respond promptly to secure their premises and vehicles. Explaining the components of the access control system, the Company Spokesperson continued, â&#x20AC;&#x153;We can help you change your access systems using the latest technology to increase the convenience for all persons who are authorized and restrict those unauthorized. An access control system has an access card as the electronic key for gaining access to the system. Card readers are electronic devices that read the information on the cards to verify and allow access. A control keypad can replace a card reader. People use electronic hardware to physically lock doors that are controlled by the access control system. An automatic unlocking feature is set to unlock at specific times without verifying access. All activities of the access control system are recorded in a system that can be accessed through the reporting features." Security Lock Service is the most sought-after locksmith in Oklahoma City for residential, corporate and automotive locksmith services. They offer 24/7 services while focusing on high standard agile services. Their technicians are skilled and friendly and will carry out assigned tasks with proficiency. Security Lock Service offers customizable and comprehensive solutions including lock rekeying, lock installation, lock replacement, key duplication, lockout services, advanced lock installation, high-security mortise, and deadbolts locks and much more. They will respond promptly to emergencies at any time of the day. About Security Locksmith Service They specialize in commercial, automotive and residential services. Established in 1960, Security Lock Service has maintained excellent standards of service through a customer-centric approach. Security Lock Service has emerged as the most reliable, efficient, knowledgeable, and economical lock and key services provider.